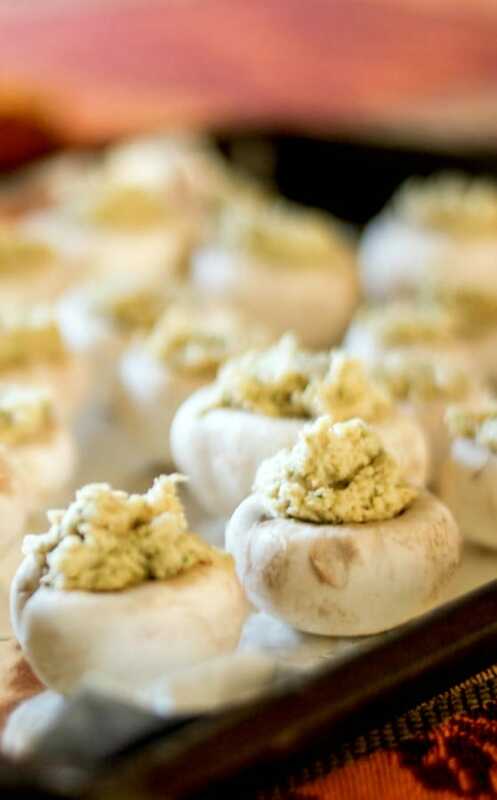 Garlicky Stuffed Mushrooms made with white button mushrooms, garlic, scallions, fresh thyme, buttery crackers are a simple appetizer that’s perfect for holiday entertaining or game day snacking. I hadn’t made stuffed mushrooms in a while so I decided to make them as an appetizer for Thanksgiving. I was going to make these sausage stuffed ones, but realized that I hadn’t made a basic stuffed mushroom with breading yet. I mean, I’ve made them over the years, but I never posted it here on the blog. You should usually never serve a new recipe right before a holiday; which is why I can share these now so you have time to try them out before the “big day” because they’d go perfectly on your Thanksgiving menu. 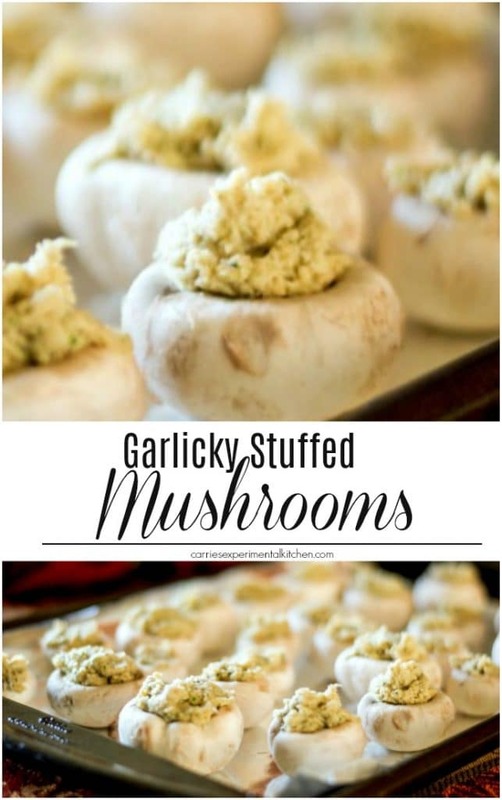 These Garlicky Stuffed Mushrooms are so easy to make and I love the fact that you utilize all of the parts of the mushroom; including the stems. Start by washing off the mushrooms to remove any dirt by gently wiping them with a damp paper towel. Next, remove the stem of the mushroom by holding the base and tilting the stem from left to right until it snaps out. Chop the stems using a knife or pulse them in a food processor. I like to use my mini chopper for this. Heat a bit of oil in a large saute pan and add the mushroom stems, scallions, garlic and thyme. Saute until the mushrooms soften approximately 3-4 minutes. While the mushrooms are cooking, crush the crackers either by using a food processor, blender or putting them in a bag and using the back of a glass; then add the crackers and melted butter to the mushroom mixture; mix well. If you don’t have any buttery crackers on hand (like Ritz, TownHouse or Club), you can use breadcrumbs, but I like the extra buttery-ness that these kinds of crackers give to this recipe. Finally, stuff the mushroom caps with the stuffing, line them on a baking sheet that’s been sprayed with cooking spray or line the pan with parchment paper or aluminum foil. Spray the tops with cooking spray and bake for 25-30 minutes until the mushrooms are lightly brown. 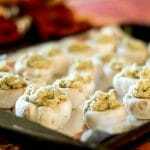 This recipe makes approximately 28 stuffed mushrooms. As a side note I prepared these the night before; then refrigerated them. When I was ready to serve the next day, I removed them from the refrigerator 30 minutes prior to baking so that they would come to room temperature. These Garlicky Stuffed Mushrooms were delicious and so easy to make, I hope you like them as much as we do. ~Enjoy! 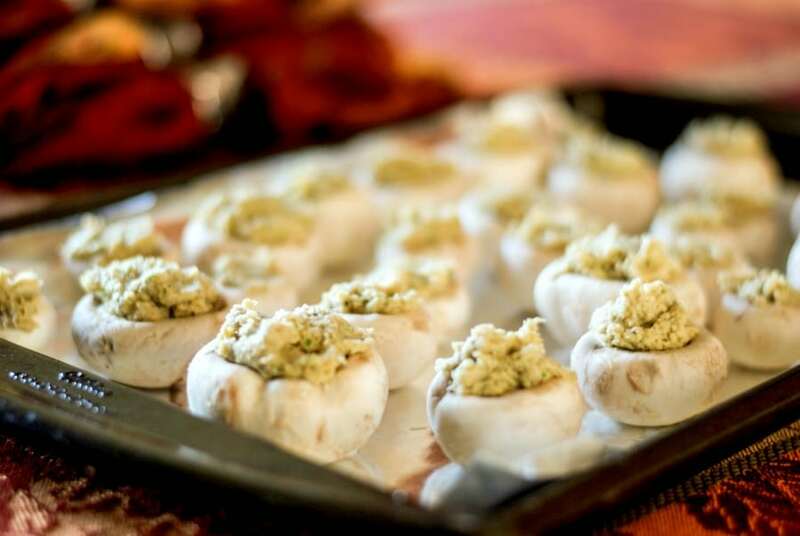 Garlicky Stuffed Mushrooms made with white button mushrooms, garlic, scallions, fresh thyme, buttery crackers are a simple appetizer that's perfect for holiday entertaining or game day snacking. Wash mushrooms to remove any dirt using a damp paper towel; then de-stem the mushrooms by holding the base and tilting the stem from left to right until it snaps out. Chop the stems using a knife or put them in a food processor. Heat the oil in a saute pan and add the chopped mushroom stems, scallions, garlic and thyme. Saute until the mushrooms soften. Next, crush the crackers either by using a food processor, blender or putting them in a bag and using the back of a glass; then add the crackers and melted butter to the mushroom mixture and mix well. Stuff the mushroom caps, line them on a baking sheet, spray the tops with cooking spray and bake for 25-30 minutes until the mushrooms are lightly brown. Makes approx. 28 pieces. *I breaded, covered and refrigerated these the day before. Then, when ready to serve the next day, I removed them from the refrigerator 30 minutes prior to baking so that they would come to room temperature. **For this recipe, I used three 14 count packages of Ritz crackers. *Originally shared December 2012/Updated September 2018.